Introduction: Last year, Shimano’s redesigned Curado, version “E”, narrowly edged out the Revo Winch in our Low Speed Reel Shootout, but was the race really that close? Think about it, a reel with the line capacity of a traditional 200 sized reel yet in a 100 sized reel’s body. All it would have to do is perform up to par and it should be a slam dunk! Yes, Shimano’s Curado E, introduced at ICAST 2008, is that impressive and it’s no wonder the reel won our coveted Editor’s Choice award from Zander. 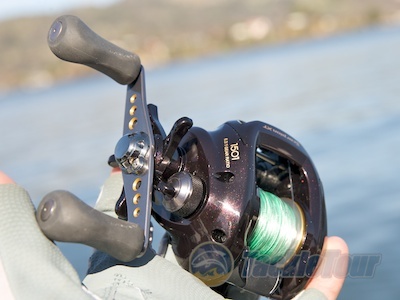 I only have one problem with that reel – the Curado E5 is available only in right hand retrieve. Enter Shimano America Corporation’s big sister, Shimano Japan. Until recently, reel introductions from this company hit the Japanese Domestic Market (JDM) prior to releases here in the United States, but the tide has shifted in recent years to favor the North American Market – at least with bass fishing gear. Example? The Curado E series debuted a good six months before the announcement was made in Japan of the new Scorpion 1500/01 XT, its JDM counterpart. 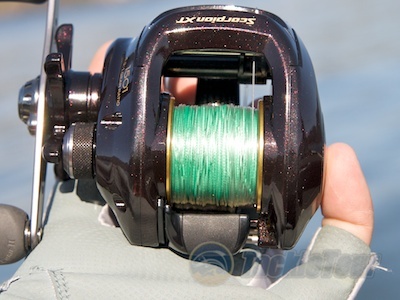 The natural assumption, or perception really, is that each USDM reel’s JDM counterpart is a refined, tuned version, of the same reel with Shimano Japan reserving “the good stuff” for their home market. Many assume this is the reason why I tend to favor the JDM reels when the primary reason is I can more easily obtain left hand retrieve versions from Japan. Case in point? 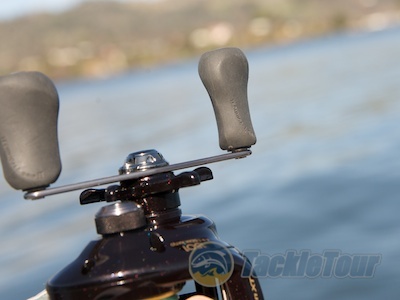 The Calais 100a and Calcutta 100DC are not available in left hand retrieve here in the States. These are two of my favorite reels in the Shimano lineup. Fortunately in Japan there exists the Antares AR and Conquest 100/101DC – both available in left hand retrieve and both the carbon copy JDM versions of the previously mentioned USDM reels respectively. So, is the Scorpion 1500/01 XT available in a 5:1 retrieve ration in left hand retrieve? Sadly no. The Scorpion 1500/01 XT comes only in 6.3:1 and 7.1:1 retrieve ratios but both versions of this reel are indeed available in left and right hand retrieve. 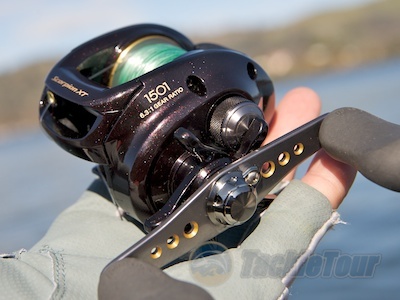 Introducing our review of Shimano Japan’s Scorpion 1500/01 XT. Impressions: Having fished the Curado E in the Fall of 2008 out on Dream Lake Alabama, I pretty much knew what to expect out of the Scorpion 1501 XT. The finish on this JDM reel keeps in tradition with the old Scorpion 1500 series which skipped the “D” version translation. Good thing because the form factor and ergonomics of the current version are superior. The big difference people will find between the JDM and USDM versions of this reel are the knobs. The Scorpion 1501 XT comes with the traditional Shimano, ergonomically contoured, septon grips while the Curado E comes equipped with the big, intrusive, almost obnoxious mutation of the same basic design – have to love the mutation. 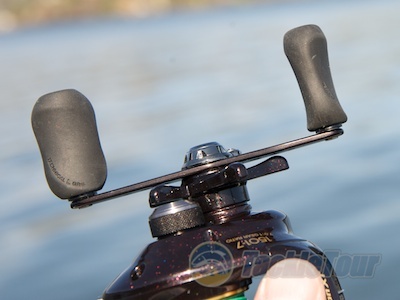 Though their aesthetics are really off, the mutated septon grips are a huge benefit while fishing.